I am a Restaurant.com sponsored blogger and am writing this post as part of the Restaurant.com Review Crew program. However, all statements and opinions are 100% my own. 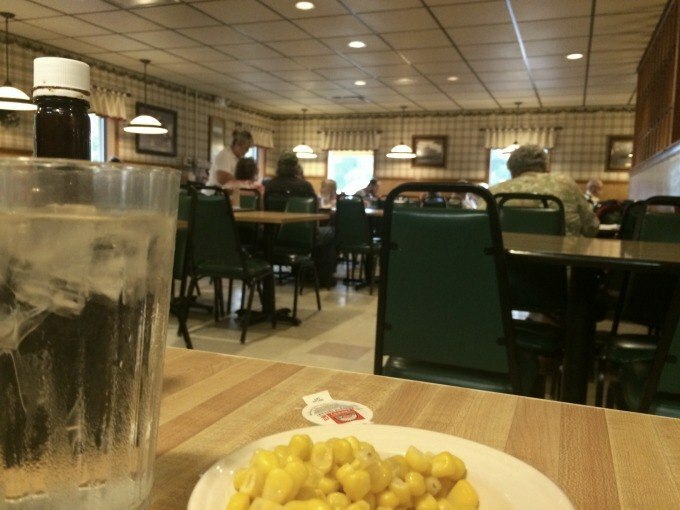 I began planning my second visit to Lyn-Way Restaurant in Ashland, Ohio before I’d left the restaurant on my first visit. Was it because the food was that good? Or the service was great? The food was good and we did receive fabulous service, but that wasn’t the sole reason for our return. Want to know what drew us back? The pie. Yep. And if you read my previous review, you’ll know that my husband and I didn’t even taste the pie on that visit. So why would we return to the restaurant for pie if we hadn’t even tried it the first time we were there? That’s easy. Lyn-Way Restaurant is KNOWN in these parts for their delicious homemade pies. I simply did not feel that I had provided a fair review since I’d not sampled one of the 25 pies on the menu (that’s my excuse and I’m sticking to it). Lyn-Way got its start with a slice of pie and cup of coffee, how could I not eat a slice? My husband and I drove back to Ashland with the intent to finally try a piece of pie. But we made a few other stops after leaving our house and by the time we arrived at the restaurant, we had developed an appetite. On our first visit we’d purchased appetizers and burgers, this trip we decided to try a meal. 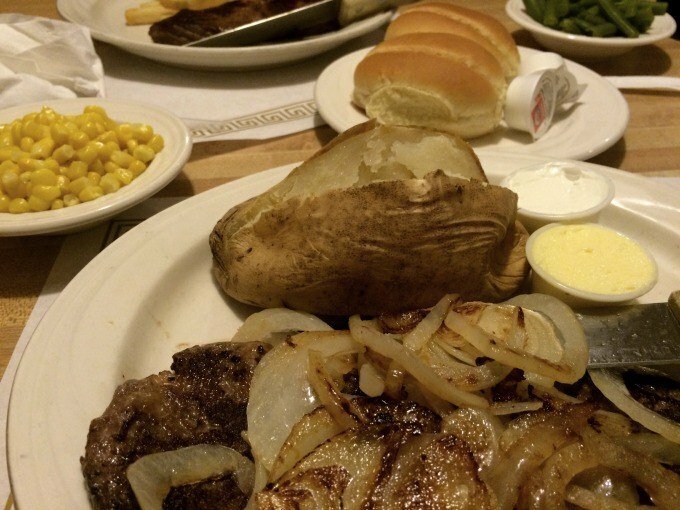 My husband ordered a steak while to my husband’s horror, I opted for Liver & Onions. It’s one of my favorite meals but my family hates it so I never cook liver at home. Once again, we received prompt and friendly service. Our waitress was attentive without hovering over us. To my husband’s delight, we never once had to ask for soda or water refills. My husband enjoyed his steak, French fries and green beans while my baked potato, corn and liver and onions hit the spot. Everything was so good, but it wasn’t until after we’d finished our meal that we realized we’d made a mistake. We’d eaten enough that we were no longer hungry. 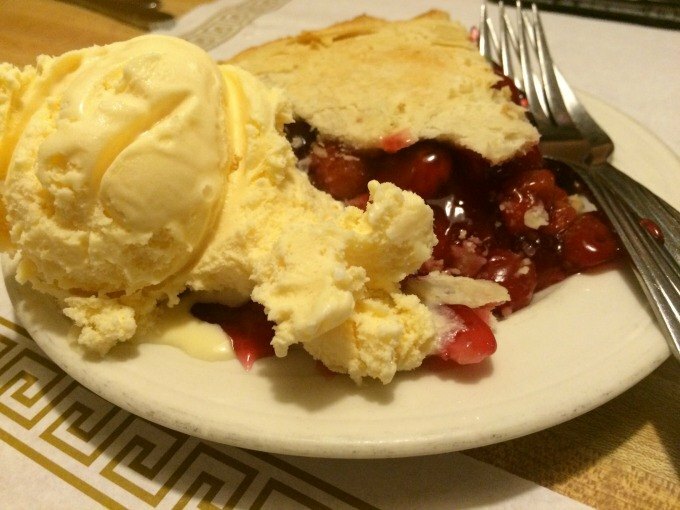 We were not going to leave again without tasting a pie, any pie, so we decided to share a cherry pie a la mode. Personally, I could have done without the ice cream but my husband has a sweet tooth that demands sugar and lots of it. Our pie was delivered to our table warmed to perfection within minutes. I was apprehensive. What if the pie didn’t live up to its reputation? 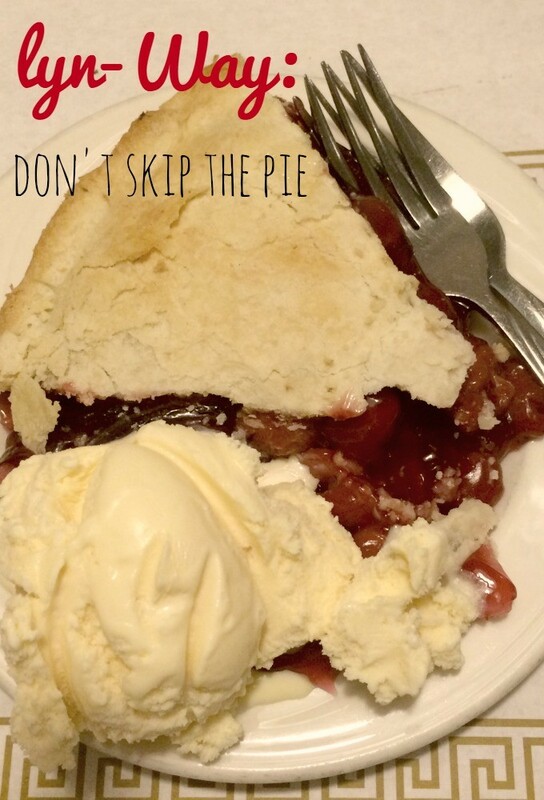 With a sigh, I lifted my fork to my mouth and took a bite of homemade cherry pie with a perfectly flaky crust. For a moment, I forgot that I was still seated in the booth of the restaurant. If I’d closed my eyes I almost could pretend that I was sitting in my grandma’s kitchen. Thanks for the reminder of what that felt like Lyn-Way. I’ll be back. Want to dine at Lyn-Way in Ashland? Hours: Monday through Thursday 7 a.m. to 10 p.m.
Friday and Saturday 7 a.m. to 11 p.m.
Sunday 4 p.m. to 10 p.m. Think of your Restaurant.com gift certificate as a coupon towards monies off your purchase. Our Restaurant.com gift certificate required us to spend $20 to redeem our $10 gift certificate, to cover the cost of the food for the restaurant. Restaurant.com partners with establishments in the hope of enticing new customers to give these restaurants a try. Most of the restaurants that participate are smaller, independently, locally owned properties. After you order, simply present the cashier the printed gift certificate or show it on your phone. The cashier will validate the certificate and deduct the certificate amount from the total. When the certificate is validated, it triggers a short survey that is sent via email. This allows customers to share feedback about the experience that will help other Restaurant.com diners make an informed decision about where to eat. Are you interested in finding new places to dine and saving money in the process? Restaurant.com can help. You can follow Restaurant.com on Twitter, Facebook and Instagram to learn of any upcoming specials. © 2015 – 2016, Tonya Prater. All rights reserved. I live in Ashland and love Lyn-Way pie! Yum!!! I really like the Coconut Cream. My father-in-law loves the Elderberry. I like the Candy Bar pie but they don’t have it all the time! I love their stuffed pepper soup too. Delicious! I love Bella Bleu Restaurant and the desserts at Downtown Perk in Ashland too, Did you shop at Grandpa’s Cheese Barn and Sweetie’s Chocolates? kristiedonelson(at)gmail(dot)com Thank you. My son loves Coconut Cream so I’ll have to keep that in mind. I bet the stuffed pepper soup is delicious- makes me hungry for stuffed pepper just thinking about it. I didn’t stop at Grandpa’s Cheese Barn and Sweetie’s Chocolates this time around, but I have in the past. I love Lynway. I need to go back there soon!